Contractor and construction customer relationship management (CRM) tools help those in specialized trades like roofing or plumbing as well as residential or commercial construction companies manage contacts, bids and projects. We compared several industry-specific as well as general use options with tools like proposal and project management to determine the top six and overall best for the construction industry. The construction industry includes several niches like home builders, general contractors, and commercial and public project builders. When considering the best CRM software options, we looked at construction-specific and general use CRMs with industry-adaptable features. Our criteria included ease of use, proposal and project management as well as features to help manage sales and marketing. Based on these criteria, we determined Cosential to be the overall best construction CRM. It offers core CRM features like contact and prospect management, reporting and marketing. It also offers more construction-specific features like proposal automation and publishing, project detail management, personnel data management, task automation, and mobile access, making it a great solution for contractors, and construction companies alike. Cosential is a construction CRM and is rated the best thanks to an affordable price with features like proposal automation and publishing. It also offers a central database for housing sales, financial records, project detail, HR, and other data as well as a beta program for users to test prereleased features. This makes it a great for construction companies responding to request for proposals (RFPs) wanting a CRM with a good mix of features and value. Cosential starts at a competitive $25 per user, per month for its entry-level plan with basic features to $95 per user, per month for its higher-end packages. All plans offer a customer success manager, are mobile-friendly, and include email, phone support, and third-party integrations. Set-up and implementation services are also offered for a fee. Cosential’s Casual/Read Only tier is the starter plan priced at $25 per user, per month and includes contact and lead management, dashboards, and limited reports access. However, at this level, only core CRM features are included. Cosential’s starter plan is very basic and does not offer a comprehensive set of specialized construction CRM features, making it more comparable to general-use CRMs. While this plan may not give you access to more construction-specific features, it is a great option for contractors and construction companies looking to get started with a basic CRM with the ability to scale as their business grows. It’s also an affordable option for solo professionals or businesses that don’t want to pay for features they don’t intend to use like email campaigns or more advanced automation. Priced at $55 per user, per month, the Sales/Business Development plan builds on the Casual/Read Only plan offering full reporting access, a business card scanner which comes in handy for field-based employees, contact enrichment tools, and activity logs. Compared to the starter plan, these features make prospecting easier with the business card scanner and contact enrichment. Access to full reporting also helps you to focus on the most important tasks. The CRM features in this plan make business development easier. It is, therefore, best for construction companies looking for tools that will help them be more efficient when prospecting and generating leads. Priced at $95 per user, per month, this plan builds on the Sales plan offering marketing, financial analytics, revenue projections, personnel data access, and survey engine. Proposal automation makes it unique, allowing you to build proposals by selecting information you wish to include and then letting the tool populate the proposal with your data and allowing you to publish it with professional tools like Adobe InDesign or Microsoft Word. The features in this plan help construction companies expand their reach with marketing campaigns and the ability to respond to more bids more quickly with accurate and up to date information pulled from the database. It is, therefore, best for construction companies that execute marketing campaigns and that respond to a high volume of bids and need proposal automation and publishing. 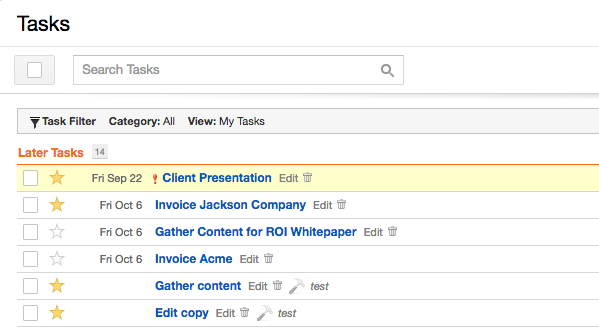 Cosential is missing native full-featured project management tools. However, it does integrate with construction project management tools like Procore. Without project management integration, it does allow you to access details about projects which can be found in the central database. It’s also missing proposal automation in lower tiers and custom proposal template development services, both offered by JobProgress. Cosential users love the software. The database or central information platform, the proposal automation, and the marketing features are user favorites. Minor glitches, the system being occasionally slow, and time to fix glitches come up in negative reviews. See our Cosential review article here. Construction companies that need a solid construction CRM with proposal automation features should try Cosential. It offers free demos to walk you through the product to see if it’s right for your business. Visit Cosential today to learn more. Buildertrend is a construction CRM with lead, contact, and project management tools. Its unique feature is a portal allowing customers to participate in projects by selecting materials, approving change orders, and more. This makes it great for home builders, remodelers, and commercial builders wanting customer interaction in the building process. Buildertrend’s pricing starts at $99 per month for unlimited users. It’s priced on a per-project basis. For companies with multiple projects, the pricing for additional projects is less than $99 per month but is provided based on a quote. This contractor CRM has an array of features with the most notable being its mobile app and customer portal. The brandable customer portal lets you include clients in the building process by allowing them to make option selections, letting them approve change orders, and share photos and videos. The mobile app allows your team to work from anywhere with full access to product features. This construction CRM offers a client-facing portal that connects you with your customers and includes them in the building or remodeling process. Your customers can log into a site with your branding and select options for their home, approve change orders, view and comment on project photos and videos. Buildertrend’s client portal is more feature rich than JobProgress’ client-facing web page which displays project information but is not as interactive. Buildertrend’s project and task management features allow you to create to-do lists connected to jobs and projects quickly and easily and communicate the status updates with stakeholders. The mobile app even allows you to create and manage tasks using the voice to text dictation. You can also manage schedules with the calendar tools so that tasks get complete. This contractor CRM has subcontractor management tools to help you manage subcontractors like electricians, roofers, plumbers, and so on. With these tools, you can create the criteria for your bid, determine if you want the bid to be quoted as a flat fee or with line items, and send invitations to bid to contractors stored in your contacts. You can also create or upload templates so that you don’t have to create bid invitations from scratch. Buildertrend has sales and marketing tools like giving you the ability to schedule individual and mass email campaigns and email templates that save time. It also offers web-to-lead forms to capture website visitor contact information and a proposal editor to create and send professional looking proposals. Buildertrend CRM includes full functionality on mobile devices allowing you to view, edit, and share access to project documents on the go. It has 21 different feature categories including photos, where you can take pictures, draw on them to point things out, and share them with clients and team members. There’s also a time clock with geolocation feature that lets you clock in from a job site. Buildertrend is missing reporting and analytics features and a visual Kanban-style pipeline. It also lacks revenue forecasting and other reports that come in handy when planning for the future and deciding which opportunities to focus on. If these features are important to you, Cosential is great for reporting and analytics while JobNimbus is a better option for using Kanban boards. Overall, users like Buildertrend because it’s feature-rich and easy to use. Most users love the client portal which keeps its customers involved in the building or remodeling process. Most of the dislikes were due to things they wish could be improved like fewer clicks to complete a task or other aspirational features. See our Buildertrend review article for more. Buildertrend’s full-featured mobile app, brandable client portal, and all-around comprehensive tools make it a great contractor CRM. It’s also easy to use and offers great tools for customer interaction. To learn more, try it risk-free for 30 days. JobNimbus is a construction CRM with sales, projects, and workflows management. What makes it unique is its Kanban boards for pipelines and projects combined with contract tools with esignature, and job estimate capabilities that help you sell and produce. It’s therefore great for construction companies wanting to manage sales, projects, and workflows in one platform. JobNimbus’ pricing is simple with only one tier priced at $25 per user, per month. This price point includes all features and integrations. You can also get a 10% discount if you are billed annually. It includes free training and support. There’s also a 14-day free trial to see if it’s the right contractor CRM for you. JobNimbus features make it easier to manage relationships as well as projects, jobs, and workflows with contact and lead management, task automation, and project management tools. Being able to use these features in the field with the mobile app also helps maximize productivity from anywhere. This construction CRM offers tools to help organize projects and manage tasks. You can create and use customizable Kanban boards to manage projects visually, allowing you to see where you are and what needs to be done to move things forward quickly. You can also manage specific tasks to keep projects on track with tools like email notifications and reminders and task assignments. This contractor CRM offers work scheduling tools that allow you to create tasks specific to construction jobs and then schedule the work to complete the tasks. These tools also allow you to notify managers when work is complete or in progress, which keeps everyone up to speed. You can also send and receive messages to all task and project owners and view, manage, and track schedules to increase efficiency and avoid conflicts. JobNimbus offers tools like customizable, interactive Kanban boards so you can create your own pipelines and track where you are in the sales process. This contractor CRM also allows you to create sales pipeline reports to give you an overview of all of your deals, the stages they’re in, and identify any bottlenecks. You can also create lead source reports so you can track where your best leads are coming from, which is an uncommon feature. The tools in this category allow you to create templates for contracts, proposals, and work orders so they can be used for all projects and opportunities. Digital signature features also let customers sign contracts and other paperwork on your mobile phone with their finger. These features are similar to other providers with proposal tools but lack proposal automation where CRM data populates proposals like Cosential’s proposal tools. This contractor CRM allows you to organize contacts and leads in one place, which is on par with the other providers listed here. You’re able to create notes and attach emails and call logs to your contacts and leads, which facilitates more meaningful dialogue with appropriate context. You can also assign leads to salespeople and track where leads are in the sales process. JobNimbus CRM offers the ability to create a custom workflow for your construction business. You can add the number of steps in your workflow and track the status of activities or jobs required to be complete at each stage. Automation tools let you set up task or activity triggers when there are updates to contacts or jobs. JobNimbus’ mobile app provides the ability to manage sales activities and projects from mobile devices. You’re able to receive leads assigned to you on your mobile phone. You can also contact those leads and log calls automatically and enter call notes. The mobile app also allows you to take site photos and attach them to contacts projects, contacts, and other records. You’re also able to create, send and get signatures for contracts, which makes you more productive. 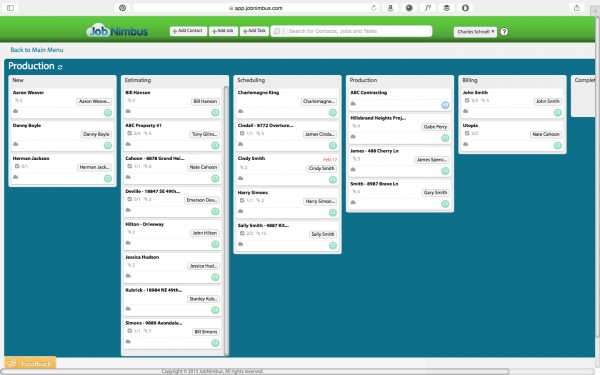 JobNimbus Production Kanban board screenshot. JobNimbus is missing a business card scanner, which comes in handy with sales and other employees spending time out in the field. It’s also missing lead scoring, which helps sales teams focus on the most promising prospects and opportunities. If these features are required, a business card scanner app or lead prioritization tool can make up for this. Alternatively, you can use a general-use CRM like Insightly that includes both of these features. Overall, users like JobNimbus. They like that the solution is very easy to use, has tools that save time, is accessible in the field via a mobile app. They also like the simple and affordable price point of $25 per user, per month. Most of the dislikes were due to aspirational features, nuances or limitations of certain features, and a desire for customer support to improve. JobNimbus’ website, mobile app, project and lead management tools, and automation tools and templates make it a great contractor CRM for contractors and construction professionals who are often on a job site. Consider JobNimbus for your construction needs by signing up for a free trial. JobProgress is a contractor CRM made for tradespeople, giving you the option to select the trade or trades you’re in when you first log-in and set up. This dictates your category selections, specific work types, and industry information in your dashboard, making setup of trade-related activities easy. It’s great for contractors in a variety of fields like roofers, carpenters, plumbers, electricians, and so on who don’t want to spend a lot of time customizing their CRM. JobProgress contractor CRM has simple pricing, at $60 per user, per month, placing it slightly above industry averages for starter plans, but well below more advanced plans. There’s also a $750 set-up fee. This pricing includes all features, from sales automation to and task management. This construction CRM makes it easy to for a variety of trades to build relationships and manage jobs even on the go. It has sales automation tools that include sales stage activity triggers, automated estimates, and automated proposals. Because JobProgress is customizable by the trade you’re in, you can select just one trade or multiple depending on your needs. Once you select your trades, you’re then able to select the type of work you do within your trade. When this is set up, and you start working with prospects and customers, you’re able to access trade and work-specific tools, templates, and categories. Your dashboard also includes industry news and ads specific to your trade type. 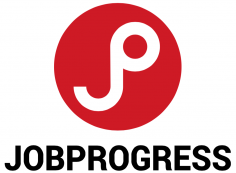 JobProgress provides a web page for customers that allows clients to stay on top of the status of their contracting progress. The web page includes a calendar to view any meetings and appointments associated with projects. You can also add your logo to reinforce your brand. Customers can access invoices, documents, and photos you share and can complete testimonials and complaints which is not featured in the other client portals. The mobile app allows you to add customers and prospects while you’re out in the field. You can use it to take photos, make notes and draw on them to highlight things you want your clients and subcontractors to see. These photos can also be attached to specific jobs. The mobile app also allows you to create and send documents to your clients, which can be approved and signed right on your mobile device as well. JobProgress helps with sales productivity, sales workflows, and sales automation features. For instance, once you’ve established your sales automation process, you can set-up triggers for activities and tasks like emails to be automatically sent. Workflows and automation rules can be customized by your needs. JobProgress offers proposal templates and automation tools designed to save you time from having to develop proposals from scratch. It even offers to customize proposals for a fee of $75 per hour. Proposal automation tools allow you to pull in financial data needed for proposals. There are also pre-made templates suitable for specific trades. One unique feature is the ability to import your proposals and create templates from them. JobProgress is missing a built-in voice-over-internet-protocol (VoIP) to make and log calls as you’re working in the tool. A built-in VoIP can help with customer communication and make it easier for salespeople to follow-up on phone related tasks. If this feature is important, consider a phone solution like RingCentral to use alongside this construction CRM. Overall, users like JobProgress. They like that it’s customizable to suit a variety of trades. Negative comments are minor and include things like minor glitches, aspirational features, and a desire to make current features better. JobProgress is a great option for trade professionals who would rather focus on completing jobs and growing their business through satisfied clients than setting up a CRM system. Sign up for a live demo to see if this contractor CRM will work for you and your trade. Visit its website to learn more. 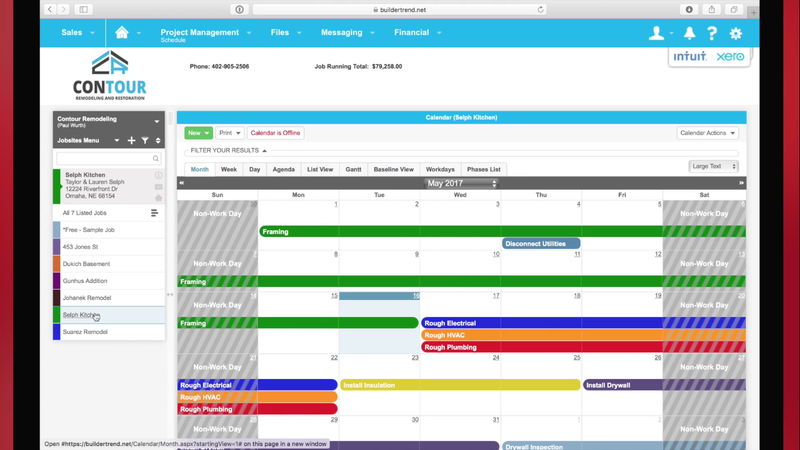 Insightly is a full-featured CRM with sales and project management capabilities. It also includes prospecting features like a built-in Business Card Scanner as well as email templates, web-to-lead forms, and automated lead assignment rules. Its task and project management features along with lead scoring and analytics make it best for construction companies wanting a lower-cost, general-use CRM that can expand as a business model grows. Insightly is affordably priced, starting at $29 per user, per month with an annual agreement. Month-to-month billing plans are also available. As your needs grow and you require more advanced tools like workflow automation and role-based permissions, prices are still competitive at $49 per user, per month. The Plus plan offers core CRM functionality including task, opportunity, and contact management. It also offers project management features that allow you to manage construction projects post-sale. The price is $29 per user, per month which is a great value for a full-featured CRM that offers project management, an important construction CRM feature. This is a terrific option for companies needing a full-featured CRM with project management at an affordable price but doesn’t necessarily need trade or niche specific features as they grow. Compared to Cosential’s starter plan at $25 per user, per month where project management features are not native, this plan offers an important feature, which is project management. If you anticipate needing tools like proposal automation down the road, Cosential may be a better option. The Professional Plan offers business owners tools like workflow automation and lead assignments to make their teams more efficient and focused on the best opportunities. They can also customize their dashboards and focus on the tasks and metrics that are important to their businesses. This plan is best for contractors with medium to large sales teams that may be segmented by territory or product. 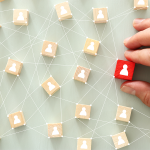 Tools like lead assignments, role or profile permissions, and workflow automation help sales managers better direct their team’s sales activities. Expanded email capabilities such as the number of mass emails and email templates can also help construction companies increase team productivity at an affordable price of $49 per user, per month. Insightly is missing call integration, where calls can be made, received, and tracked right in the software. If this feature is important, integrating with a VoIP solution like RingCentral could work for making calls. It’s also missing proposal automation features which can help make the proposal process more efficient. If this feature is important, Cosential or JobProgress may be better options. Insightly users love the project management features. They like the fact that they can stay involved with customers even after a deal is closed. They also think Insightly could improve on how they approach training and onboarding. For more information on Insightly user reviews, see our Insightly review article. If your business could benefit from a CRM with both sales and project management tools, consider Insightly. Insightly gives construction business owners tools to help build long-term relationships while helping them stay on top of sales activities throughout the entire sales lifecycle. You can sign-up for an Insightly free trial to see if it’s right for you. MarketSharp is a construction CRM that focuses on marketing and repeat business. What makes it unique is its lead generation approach with tools like SmartMail that coordinates multiple media channels like direct mail, social media, and landing pages to generate leads. It’s great for construction companies wanting robust marketing and relationship building tools to grow both primary and repeat business. MarketSharp construction CRM pricing starts at $85 per user, per month and goes up to $115 per user, per month. It has three options within each tier. Within each option are price reduction bands by numbers of users. There’s also an implementation fee of $500. The Lite plan offers a core set of CRM features like contact management, scheduling and calendar management, and repeat and referral marketing and is priced starting at $30 per user, per month for more than 20 users. These basic productivity and marketing tools are a great starting point to gain efficiencies and begin coordinated outreach or lead generation efforts. For small construction companies only needing core contact management features and basic marketing features, this is a great starter plan. However, the starting price point is substantially higher than the other options in this article that have many more robust features either in its starting plans or have lower one tiered all-inclusive pricing. The Standard plan builds on the lite plan offering features like call center and scripting management and direct mail referral outreach. These tools allow construction companies to scale their marketing efforts further and grow their pipelines and prospects. Prices in this tier start at $35 per user, per month for more than 20 users and are higher than pricing for most of the other industry-specific options presented for smaller companies with one to four users. This plan is great for construction companies wanting to expand their marketing and sales tool belt to grow their businesses. It allows you to create campaigns and offers based on customer needs. The Pro plan builds on the Standard and Lite plans, offering tools like proposal and production management and job costing and QuickBooks integration. These features not only allow you to grow your business, but they also let you manage more post-sale, project-related activities within the CRM. Starting at $40 per user, per month for more than 20 users, it’s still above most of the other solutions except Buildertrend, if you have multiple projects, which is priced at $99 per project. The Pro plan is great for construction companies wanting to manage most project related tasks within their CRM, from contact management to project or production management. As far as features, it’s comparable in level of robustness to the other options presented here. MarketSharp is missing lead scoring tools and a business card scanner. Lead scoring comes in handy when prioritizing leads, and a business card scanner comes in handy when generating leads out in the field. If these features are important, consider single add-on apps that offer lead scoring or can scan and add leads to your CRM with a business card scanner. Alternatively, Insightly is a great choice. Overall, users like MarketSharp. They like the robust features, videos, and levels of support. Some user dislike revolves around initial learning curve and pricing. MarketSharp can be found on its website with the ability to get a free demo to see if it’s a good contractor CRM for your business. It’s great for construction companies looking for a solution with robust lead generation and marketing tools. If you’re interested in a construction CRM with these features, consider requesting a demo. The best construction CRMs are easy to use, offer tools that make it easy to attract leads, manage projects, and close deals. Whether you’re looking for a contractor CRM specific to your trade or one that covers a broader spectrum within construction, we’ve covered a CRM that will work for you.